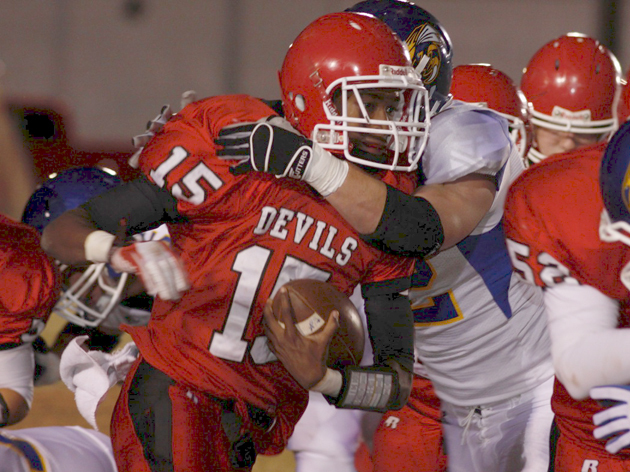 Kevin Richardson, graduating senior quarterback, wide receiver, defensive back/safety and kick and punt returner at Jacksonville High School in Jacksonville, Arkansas, is one of the most talented high school football players available in the 2013 college football recruiting class. You can see his highlight videos here: Kevin Richardson’s Highlights. Kevin Richardson is 6’0 and 160 pounds. Richardson epitomizes versatility. As aforementioned, he played on both sides of the ball: quarterback, wide receiver and defensive back/safety and proved to be an explosive kick and punt returner. For college football programs looking to add value to their programs, Richardson would be indisputable asset. Richard Davenport, an Arkansas sports reporter, revealed that Kevin Richardson ran a faster time than Altee Tenpenny, running back who has verbally committed to Alabama, at the FCA Combine: Richardson ran a 4.44 and Tenpenny ran a 4.47 (source). Richardson has great speed and a knack for separating from defenders, whether it’s in his role as wide receiver, punt returner, or kick returner. Kevin Richardson is working on adding more weight and muscle. Any program he signs with will, of course, help him to gain the necessary weight and muscle he needs. He has a boundless athletic upside. His coaches see him as becoming the next Jarius Wright, Minnesota Vikings wide receiver and former Arkansas Razorbacks wide receiver. College football teams in the state of Arkansas would be served well by recruiting him. Richardson will inevitably be signed by a quality football program. He has the potential to make a significant impact on the field in his first year. Richardson is a player who will not be a “work-in-progress” or “development project” type player—he’s ready to play right now. His ability to play at a high level on both sides of the ball and on special teams would benefit any team at any level. College football fans are in for a treat, as they are about to witness an unquestionably gifted player who has the potential to be “the next big thing.” He’s a head football coach’s dream: a player who can perform well at all aspects of the game: offense, defense, and special teams.